"Enter a new world of landscapes that stretch far beyond your imagination and dreams." the included guidebook has been written for readers of all levels, with clear descriptions and images for each card, tarot spreads, journal prompts and more. this colourful rendition of the 78 (+1) cards of the Major and minor arcana represents the culmination of many paintings, illustrations and photographic elements created by danielle noel. THE STARCHILD TAROT FIRST EDITION 2013-2014, which features a turquoise box, and different artwork for all 78 cards. THE STARCHILD TAROT - AKASHIC (as seen below): which originally featured the Stargate and Starseed box covers, and included a 79th card (The Akashic Records). After this, the Starseed (right) box was no longer printed, as it was a limited edition run. The Stargate cover (left), however, will remain as the future reprint of this larger deck. Each deck comes with a complete 190 page guidebook. The Starchild Tarot AKASHIC - (new) Traditional-size EDITION as seen below - comes with a complete, 190 page guidebook. Welcome dear reader, thank you for visiting my site! I am a multidisciplinary artist who creates intuitive wellness tools and visual pieces for spiritual practitioners and seekers. A lot of my work is thematically based in ancient lore and history, Energy Medicine, the Divine Feminine and sacred symbology, in blending old mysticism with new visual keys. I like to create bright and vibrant images in my artwork just as much as I delve into darker, vintage aesthetics, which is how I reflect the balance of light and shadow that we experience as human. Somewhere along my journey, I decided to create my own Tarot deck, entitled, The Starchild Tarot, which was at first, a personal project that ended up turning into a full-time love. 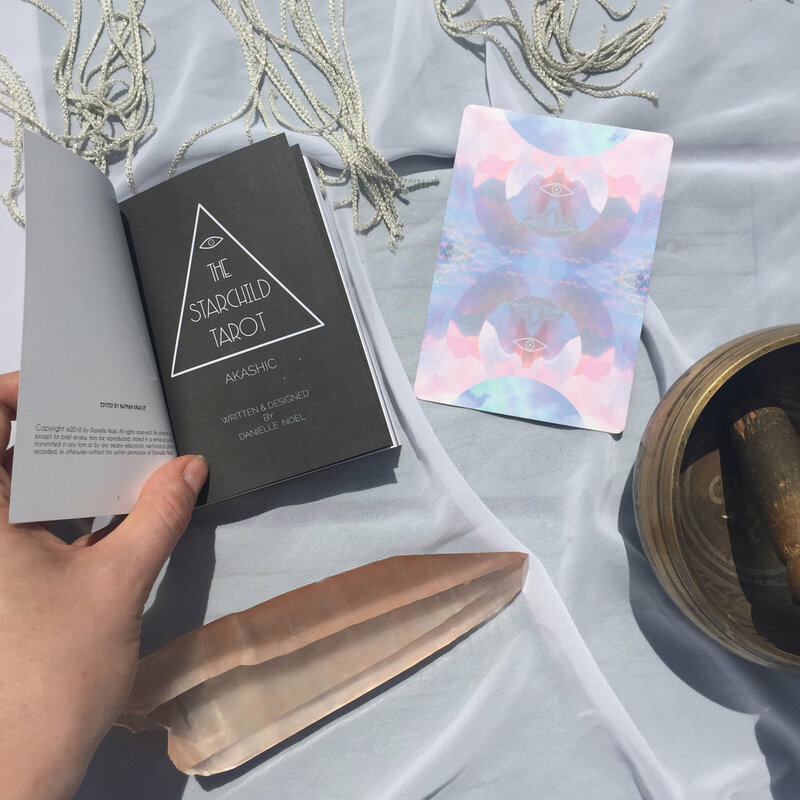 I also recently launched my second deck, The Moonchild Tarot, and published my first book with Penguin Random House UK, The Book of Tarot - a Guide for Modern Mystics. I live with the love of my life, Sterling, our two rescue Chi's, and cat, on Gabriola island, British Columbia, Canada. Artist - The Wisdom of Unicorns with author Joules Taylor Ebury Publishing. Potter Clarkson Publishing. Artist - Work your Light - Oracle deck with author Rebecca Campbell - June, 2018 through Hay House Publishing.